Men like Sebastian want only one thing, and Natalie has vowed not to give it to him. Yes, he’s gorgeous, intelligent and heroic, but he’s also a constant reminder that she isn’t good enough for him. Can she outrun a club owner who wants her dead when she’s weighed down by the failures of her past? 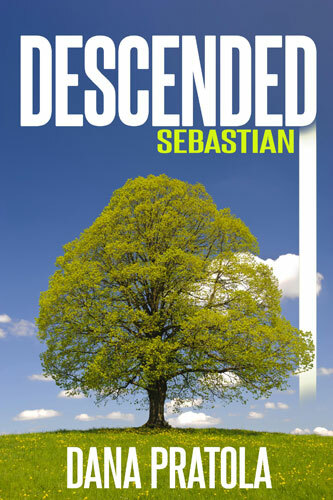 Hi, we’re interviewing Mr. Sebastian Gray from Dana Pratola’s newest book Descended: Sebastian. It’s the second in a series. I’ve read the first one, so I’m guessing this one will also deal with a man who is more than ordinarily powerful, and perhaps a woman who might just show him his power isn’t going to be enough to deal with her in quite the way he plans. 1. What do you do for a living, Mr. Gray, and how’s business? I’m an architect, and business is fantastic, thanks for asking. 2. You’ve been seen with some remarkably beautiful women, but none for very long. What’s your secret to fighting them off, especially since you basically propositioned every one at that Las Vegas bar the other night? Hmm. Fighting them off…not what I’m known for. But when I was with a woman, and our time was up, I was always honest. Right from the start. I had no desire to mislead anyone. 3. That flight from Las Vegas must have been terrifying. At least one passenger said you appeared to be meditating or chanting. Does that relax you, or was there some other reason for doing it? >> I have no idea what you’re talking about. 4. There seems to be one woman you not only didn’t try to fight off, but actually may have kidnapped? What makes Natalie different? >> Nat…she’s…. I don’t know if I can answer that. She just is. 5. Some of us like to exercise the “phone a friend” option at odd times in our lives, but it seems especially odd that you brought Mike in to help you solve the problem of Natalie. What’s special about him? >> Mike’s been my friend for years. We’re more like brothers than anything and when I need him, he’s always there. Sometimes he does the thinking for me. Helps me see things I might have missed because I’m too eager, or not paying attention. I’ve never known loyalty like his. 6. What did you think when the police showed up, and who did you think Matt was? >> I thought Matt was Natalie’s boyfriend. I had the impression he did too. But when the cops charged in, all I could think was, great, I’m going to prison and I dragged Mike down with me. 7. What do you think made Natalie claim she came to your apartment of her own free will? >> I want to believe it was just because she thought I was hot, but I know she had her reasons, pertaining to Matt. 8. Who would want to, or have the power to, interfere with your plans for Natalie? >> Only one person could try to interfere. Jett Cestone. But I can handle him. 9. Do you think it’s going to be easy to get rid of her? >> I have no intention of getting rid of Natalie. Ever. 10. Do you really want to? I like the ‘character interview’ idea. I may steal it, if you don’t mind (the idea, not the character).